These are words of Padmashri Dr Tatyarao Lahane, Dean of J.J.Hospital Mumbai. He had come all the way from Mumbai to attend Eye Specialists’ Conference of Vidarbha region in Yavatmal on November 3 & 4, 2012. 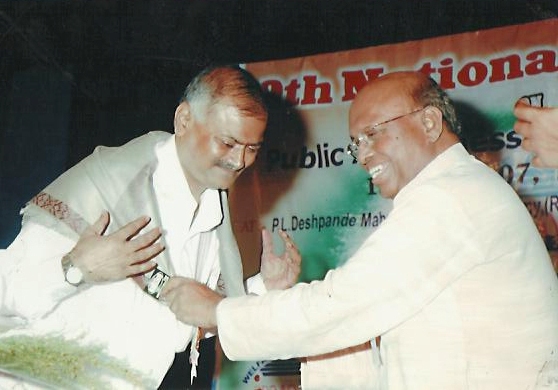 Dr Tatyarao Lahane has made one lakh and thirty five thousand ophthalmic operations so far. He says he receives afresh inspiration while planting light in those people’s lives that are born with darkness and this magic is worked by words of blessing on the lips of cured patients. He spoke out the need of accessibility of update knowledge to rural areas. There are many medical practitioners having very little information about modern techniques in these fields. This is the sole cause for which I preferred to come over here to Jablapur and Pune. You will surprise to know how I work such lengthy hours despite a patient of kidney. I owe whatever I do to my mother Ajana Bai who has donated me a kidney of her on 22 February 1995. Now I work 13 to 14 hours daily inexhaustibly. I wonder where I get this much energy from. Dr Tatyarao Lahane has also brought to light yet another bitter reality related to this field. He said that in our country, there is a rich tradition of narrating stories of philanthropy but its legacy is not carried on in the real practice. Every year eighty thousand people die in India and we get only fifty thousand eyes from the dead, among those 30 % are of no use. At present 22 lakh people are in need of eyes. Sri Lanka is a country of Ravana where one lakh people expire every year and the same number of eyes are obtained of which ten thousand eyes are sent to India, then let me know whose country is better. Ravana’s or that of Rama’s, is Dr Lahane‘s question to us. Here I recall john Milton’s poem On His Blindness at this moment, which describes Milton’s agony of being blind and helplessness to use natural gift endowed to him. He fears that it would go unused because of his blindness. Similarly, there are many blind persons in India who have been gripped by the devastating fear. I think Dr Tatyarao Lahane encourages them by his noble example. Indeed, Tatyarao Lahane is an ideal medical practitioner who has dedicated his whole life to spread light in those people’s life whose light is spent. So let’s hope that he may live long for the cause he wants to fulfill.